This Fall, Disney•Pixar celebrates homecoming with the release of Monsters University on Digital HD and Digital HD 3D on October 8, 2013, followed by the 4-Disc Ultimate Collector’s Edition Blu-ray 3D Combo Pack, 3-Disc Collector’s Edition Blu-ray Combo Pack, 3-Disc Blu-ray Combo Pack, DVD and On-Demand on October 29, 2013. Ever since college-bound Mike Wazowski (voice of Billy Crystal) was a little monster, he has dreamed of becoming a Scarer—and he knows better than anyone that the best Scarers come from Monsters University (MU). But during his first semester at MU, Mike’s plans are derailed when he crosses paths with hotshot James P. Sullivan, “Sulley” (voice of John Goodman), a natural-born Scarer. The pair’s out-of-control competitive spirit gets them both kicked out of the University’s elite Scare Program. To make matters worse, they realize they will have to work together, along with an odd bunch of misfit monsters, if they ever hope to make things right. Monsters University bravely explores themes of self-discovery and the revelations that come with growing up. Burbank, Calif., August 8, 2013 – This Fall, Disney•Pixar celebrates homecoming with the release of Monsters University on Digital HD and Digital HD 3D on October 8, 2013, followed by the 4-Disc Ultimate Collector’s Edition Blu-ray 3D Combo Pack, 3-Disc Collector’s Edition Blu-ray Combo Pack, 3-Disc Blu-ray Combo Pack, DVD and On-Demand on October 29, 2013. After scaring up big laughs in theaters, the in-home release of Monsters University opens its doors to the movie in stunning high definition Blu-ray, and provides hours of all-new bonus material, in-depth behind the scenes features, deleted scenes, the animated theatrical short “The Blue Umbrella” and much more. Directed by Dan Scanlon (“Cars,” “Mater and the Ghostlight,” “Tracy”), produced by Kori Rae (“Up,” “The Incredibles,” “Monsters, Inc.”), and written by Dan Scanlon and Robert Baird & Dan Gerson (“Monsters, Inc.”), Monsters University marks Pixar’s 14th consecutive film to debut at number one at the box office. Ever since college-bound Mike Wazowski (voice of Billy Crystal) was a little monster, he has dreamed of becoming a Scarer—and he knows better than anyone that the best Scarers come from Monsters University (MU). But during his first semester at MU, Mike’s plans are derailed when he crosses paths with hotshot James P. Sullivan, “Sulley” (voice of John Goodman), a natural-born Scarer. The pair’s out-of-control competitive spirit gets them both kicked out of the University’s elite Scare Program. To make matters worse, they realize they will have to work together, along with an odd bunch of misfit monsters, if they ever hope to make things right. Monsters University bravely explores themes of self-discovery and the revelations that come with growing up. Joining Crystal and Goodman as part of Monsters University’s monstrously talented voice cast are Steve Buscemi (voice of Randy Boggs), Helen Mirren (voice of Dean Hardscrabble), Alfred Molina (voice of Professor Knight), Charlie Day (voice of Art), Sean P. Hayes (voice of Terri Perry), Dave Foley (voice of Terry Perry), Nathan Fillion (voice of Johnny Worthington) and Aubrey Plaza (voice of Claire Wheeler). 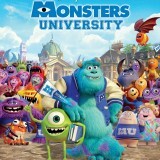 Featuring a score from recent Rock and Roll Hall of Fame inductee and award-winning composer Randy Newman (“Monsters, Inc.,” “Toy Story 3″), MU also includes music from Axwell and Sebastian Ingrosso of Swedish House Mafia. Scare Games –At Pixar, we play hard while we work. The same people who keep the film production moving – producers, managers, coordinators and artists – are also the ones who bring spirit and excitement to some of our extracurricular activities. We check out the MU production teams as they go head to head in the mostly playful Pixar Scare Games competitions.